A couple of nights ago our dogs started to off their rocker in the middle of the night – something was amiss outside. After rolling out of bed and grabbing a torch off I toddle half awake to see what all the commotion was about. And wouldn’t you know it there was a Red Kangaroo in the yard. As I approached the roo (a big male or buck) it started to come towards me in a slow and sluggish manner. “This animal is very quiet”, I thought. I watched it for a while and as I turned back towards the house it followed me. Not much I could do about it in the middle of the night. By morning it had gone and it wasn’t until the next day that I saw a photo of it near the BBQ at my brother’s place up the road. Must have thought it was time for brekkie. Not commonly seen in the Roma region, Red Kangaroos are normally found more in the central parts of Australia. Being the biggest of the Kangaroo family, we tend to see more of them during severe drought times, as they continue to move east looking for food. 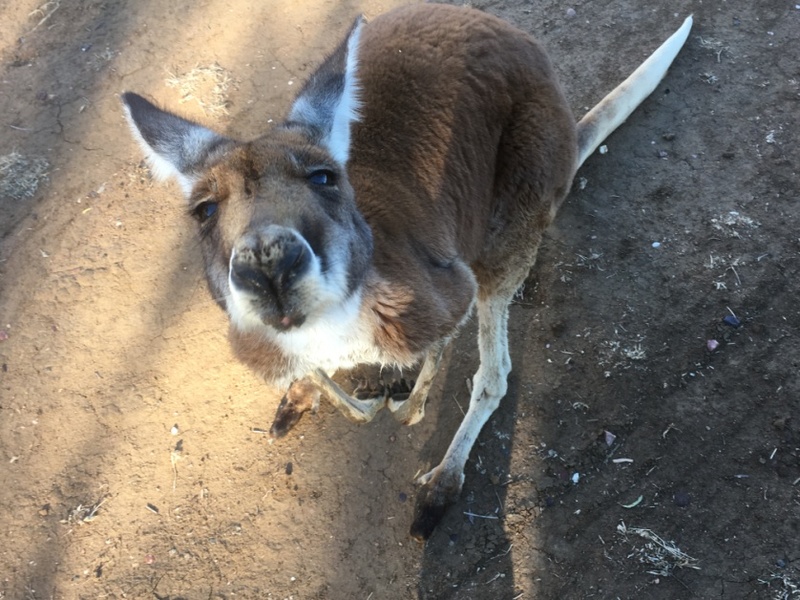 Compared to the Eastern Grey Kangaroo which are common around these parts, the Red Kangaroo is bigger, more muscular and their fur is usually a red-brown, although they can also be a blue-grey. The Reds also tend to live in smaller mobs of one or two and up to about 10 kangaroos in normal seasons, with a home range of around 8 kilometres. During drought this all goes out the window, as different mobs congregate and travel further when food is scarce. They mainly eat grasses and occasionally shrubs. They can also go without water for long periods of time. We believe someone must have raised this young buck from a joey, then perhaps it got too big for them and they let it go. Unfortunately it has now found its way to a built up area near major roads, which is not that safe for it – town dogs and vehicles being its major worry. It is also obviously quite used to back yards, people and kids. Whatever its history it is way too domesticated. A normal Kangaroo would be skittish and generally bound off in a hurry at the sight of a human or dog – definitely not this one. Our business supports a local Wildlife Caring Group called the Maranoa Wildlife Caring and Education Centre. This group has excellent carers whose main mission is to care for sick, injured or orphaned wildlife so that they can be released back into the wild. To date this group has only taken in one Red Kangaroo, a female which is still quite young – so our visitor is definitely not one from this group. When the Kangaroos are joeys there needs to be human contact to bottle feed them, toilet and clean them. 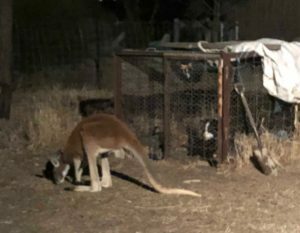 As the Kangaroo grows and becomes a teenager it is important to begin to desensitise them to humans and let their natural instincts kick in, so they have the best chance of survival when they return to the wild. This particular Roo disappeared again over night, however I’m sure it will turn up again in someone’s back yard. Our aim will be to catch it and take it out to a large soft release property, where it can hopefully gain some its natural survival skills back in a safe environment before being released fully in to the wild.